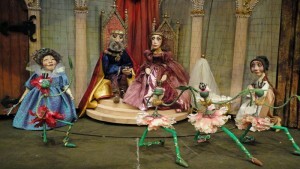 DETROIT – Puppetry is an ancient and difficult theater craft to do well. Thankfully, the Southeast Michigan theater community is blessed to have PuppetART to surprise and delight us with what the art form can deliver. I admit that when I sat down to see this Sleeping Beauty in the small Grand River Ave. theater, which also has a studio and puppet museum attached to it, as I have several times, I was off-kilter, because I quickly realized that the play would be a ballet, with no dialogue. As with a ballet, the story is supported with a series of excerpted classical music pieces from Bach, Haydn, Brahms, Mozart and more. And as it unfolded, I wondered if the kids, several of whom were as young as three and four years old, would hang in. I needn’t have bothered to worry. 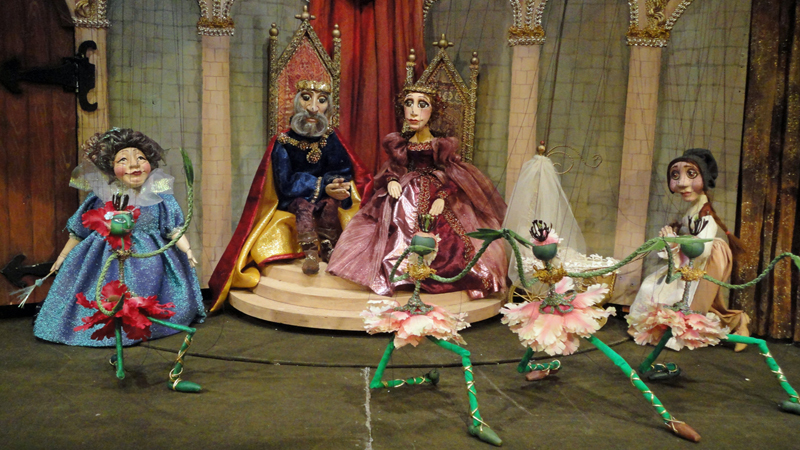 The kids were fairly rapt by the puppet stage, so beautifully lit, crafted and designed by Irina Baranovskaya to convert to different scenes – inside the castle, outside the castle, room changes. Sound and lighting also worked beautifully to convey lightning, thunder and changed of daylight. The marionette work, directed by Igor Gozman and executed by Jackie Strez and Nick Pobutsky, is remarkable. It is difficult to imagine that puppetry is done much better anywhere. The subtlety and delicacy of movement is breathtaking, from the perfect opening of Sleeping Beauty’s eyes to the gently placed hand of one puppet’s hands on the back of another to console. In a short time, especially if you are sitting back a few rows, as I was, you lose sight of the puppet strings all together. The story is familiar to most, or at least it should be. PuppetART’s version includes some new and interesting details. We all know that Sleeping Beauty has been cursed by a wicked fairy and is forced to sleep until she is awakened by a kiss from a Prince. Most versions focus upon the Princess’s story, but this production illuminates more of the story of the Prince as well. We find out how he knows of the sleeping Princess, and why he feels destined to rescue her. It should go without saying, but I’ll say it. Sleeping beauty is more than appropriate for all ages. The run time of the show is about 50 minutes.